REBOA is a minimally invasive technique using a balloon catheter to temporarily occlude large vessels in support of hemorrhage control. Hemorrhage leads to cardiovascular collapse then death unless blood flow to the heart muscle and brain is maintained. For patients with truncal hemorrhage, resuscitative aortic occlusion helps maintain blood flow to critical organs until the hemorrhage can be definitively controlled via surgery. Until REBOA, resuscitative aortic occlusion required an invasive surgical procedure which resulted in high mortality and significant resource usage. The ER-REBOA™ Catheter is specifically designed for use during REBOA. Click here for more information on this product. 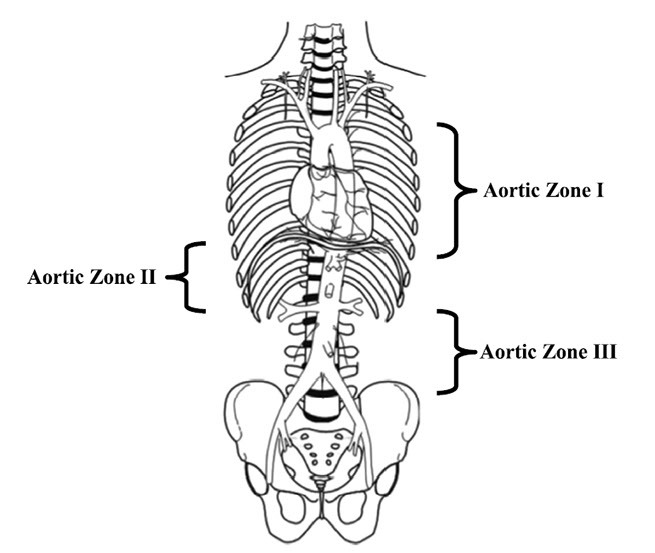 The aorta is divided into three separate zones for the purposes of REBOA (aortic length varies and is dependent on the individual).